Adolf Hitler had come to power on 30 January 1933. 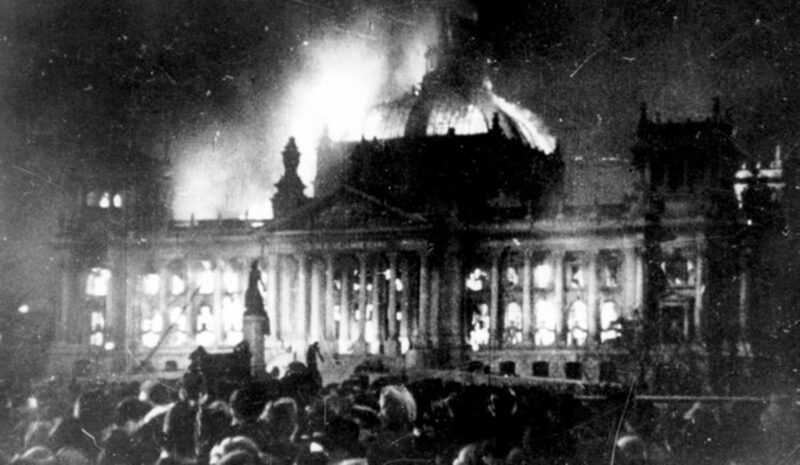 Less than four weeks later, at 10pm on 27 February 1933, the authorities were informed that the Reichstag — the German parliament building — was ablaze. At the time industrialist Carl Duisberg said, “This fire will be a beacon to lead all Germany into the hands of communism for years to come.” In fact, the communists suffered because of the fire. By 11.30pm, the conflagration had been extinguished. German police arrested a 24-year-old Dutch communist, Marinus van der Lubbe, who claimed that he alone had started the fire. Ernst Torgler was also arrested, as were three Bulgarian communists, Georgi Mikhailovich Dimitrov, Blagoi Popov and Vasily Taney. Their trial began at Leipzig on 21 September 1933 and ended exactly three months later. Van der Lubbe was brought into the courtroom in chains while the other four defendants were unfettered. Van der Lubbe was found guilty of high treason, insurrectionary arson and attempted common arson. The other four men were acquitted. Marinus van der Lubbe was beheaded in a Leipzig prison yard on 10 January 1934, three days before his 25th birthday. Such is the passage of history that authors come to very different conclusions about him. One says that he was “three quarters blind, quite mad and incapable of coordinated movements” while another insists that he was of “above average intelligence”. In 1981, a West Berlin court posthumously overturned the 1933 verdict and declared van der Lubbe not guilty. Torgler joined the Nazi Propaganda Ministry in June 1940. After the war Dimitrov returned to Bulgaria to head the Communist party there and, on 22 November 1946, succeeded Kimon Georgiev as prime minister. In 1948 he was removed from power as a result of his lax adherence to the Kremlin. Dimitrov died on 2 July 1949 in the Barvikha sanatorium near Moscow, amid rumours that he had been poisoned. Seventy years on, historians are still debating the origins of the Reichstag fire. Some, including Alan Bullock and William L. Shirer, believe that, despite the court case, the Nazis burned down the parliament building so that Hitler could consolidate his hold on power. However, Fritz Tobias wrote a detailed account of the event, which came to the conclusion that van der Lubbe was the sole arsonist. Yet in June 1931 Hitler had given an interview to Richard Breitling, the editor of Leipziger Neueste Nachrichten giving two reasons in favour of burning down the building. The first was aesthetic and the second that the Reichstag represented the degenerate bourgeoisie and the deluded working class.